For a man who we’re repeatedly told is “unelectable,” Jeremy Corbyn seems pretty good at winning elections. He’s been an MP since 1983, winning his seat eight times at a general election – and in 2015, he increased his vote in Islington North by 5.8%. Against all the odds — and all the predictions of the “punditocracy,” he was elected Labour leader last summer and increased his vote percentage again when challenged for the leadership this summer. That achievement was all the more impressive when you consider the large number of Corbyn supporting members who were prevented from voting in the poll by Labour’s NEC and the party’s Compliance Unit. Furthermore, Corbyn has received easily the most hostile press coverage any leader of the opposition in Britain has ever had to face. One can understand Tory-supporting journalists having it in for him, but in fact the most venomous attacks have come from Blairites and Brownites (aka Bitterites) in his own party. Almost every smear and slur imaginable has been deployed. The mild-mannered and extremely courteous Mr. Corbyn has been called a terrorist sympathizer, an IRA and Hamas supporter — and been linked with anti-Semitism. Like anyone who dares to challenge western foreign policy in this McCarthyite age, he’s been labeled a “Putin stooge” and has been attacked for the great “crime” of appearing on non neo-con approved news channels, such as RT and Iran’s Press TV. But all the custard pie throwing has backfired spectacularly, as Corbyn’s latest victory shows. The more the Establishment and their media attack dogs try and smear the bearded, bicycling 67-year-old, the more his popularity grows. The significance of “Jezza’s” latest victory can’t really be understated. Firstly, the Labour leader has shown that you don’t need “mainstream” media to be on your side to be successful in British politics. Corbyn wouldn’t have expected the support of the Daily Telegraph or the Daily Mail, but he didn’t have the backing of the liberal/left-leaning Mirror and Guardian either, and still won. In fact, the only newspaper consistently supportive of Corbyn has been the Morning Star — and his success is a real feather in that paper’s cap. Alternative media — and social media — means that politicians can now bypass the Murdoch press and biased television networks to get their message across. 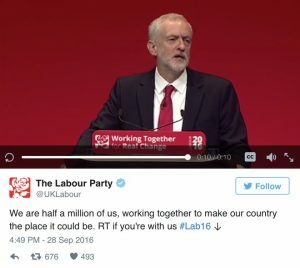 Corbyn has also revived the traditional political rally — his visits to the cities and towns of Britain have drawn huge crowds. The big rise in Labour membership under Corbyn — now up to 550,000, making it the largest membership of any party in western Europe — also means the party is less dependent on wealthy donors who may/may not try to influence policy. It’s interesting to note that in July, one wealthy donor, Michael Foster went to court to try and prevent Corbyn from automatically appearing on the leadership election ballot paper as the incumbent. Foster’s attempt failed. Like rich donors, Establishment gatekeepers and “opinion formers” in the media are not very happy either. They realise that the power they once exercised as unelected “kingmakers” has disappeared. Since Saturday, we’ve had the quite hilarious spectacle of self-important pro-war Blairites tweeting about how they’re leaving the party. As if anyone will miss them. Labour’s faux-left neocon faction are upset because they know that Corbyn’s victory means there’s a real chance of an end to the phoney elite “consensus,” which has dominated British politics in the last 30 years. Laughably called the “center ground” — there is in fact nothing “moderate” or “centrist” about the policies Tory and New Labour governments have pursued. Neoliberal reforms have led to a massive gap between the rich and poor developing — with levels of income inequality unseen since the 1930s. In foreign policy, a slavish adherence to the US has seen the UK play a leading role in a series of disastrous wars, which have led to the rise of Daesh — also known as ISIL — and a refugee crisis of biblical proportions. Corbyn — who opposed these extremist policies — offers the chance of Britain going in a different and better direction, and that’s why so many are rallying to his cause. And that’s also why those who want British politics to remain an undemocratic elite club — with only the width of a cigarette paper’s difference between the policies of Labour and the Conservatives, are having a collective nervous breakdown. But, as I argued for Sputnik before, Corbyn represents Labour’s best and probably only chance of electoral success in 2020. The idea that reheated Blairism or Brownism could defeat Theresa May in a national poll is patently absurd. The truth is that the Establishment — and that includes Labour’s right-wing, realize that “Jezza” is a danger-and could very well win a general election on a left-wing populist program, which is why they attack him 24-7. The notion that the Tories are very happy for Corbyn to be Labour leader because he’s a vote loser, also doesn’t bear close scrutiny. In June, when “chicken coup” plotters were piling the pressure on Corbyn to stand down, they were supported by the Tory leader — and Prime Minister David Cameron — who yelled “For heaven’s sake man, go!” at Corbyn in the House of Commons. In the Daily Telegraph this week, former Tory leader William Hague gave his advice to Labour “rebels” on how to topple Corbyn, saying they should launch another bid to get rid of the “hard-left leader” in 2018. Again, if the Conservatives don’t fear Corbyn, why are they teaming up with Labour right to try and depose him before the next election? You really don’t have to be Sherlock Holmes and smoke three pipes to work that one out. True democrats, who want people to have a genuine choice at election time, will, I’m sure, be heartened by Corbyn’s against-the-odds success. However, the battle is far from over. The danger is that having been re-elected as leader, Corbyn will now attempt to appease his right-wing Labour critics by revising or diluting some of his most popular policies. 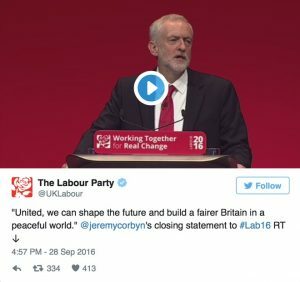 Although Corbyn has said he’ll continue to make the case against the renewal of Trident, shadow defense spokesperson Clive Lewis’ party conference speech on Monday (September 26), in which he lauded NATO, could be seen as a sign that Labour is going to cave into the powers that be on defense in order to be “allowed” to put its case for economic changes. 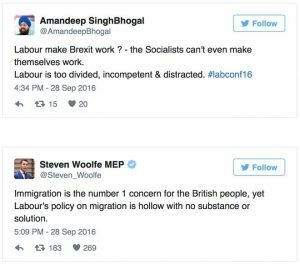 They may have lost the leadership vote, but the Labour right have been working behind the scenes to keep their control of party machinery. 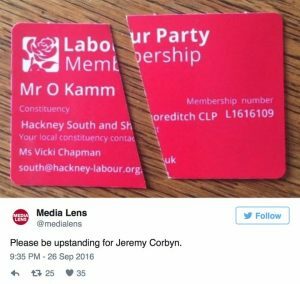 Changes to Labour’s internal rules were passed by the conference this week — tipping the balance on the party’s NEC against the Labour leader. We’ve learnt too how Labour “centrists” had been working for months to make sure that “decision-making delegates” at the conference were not Corbyn supporters. Instead of trying to placate those hell-bent on destroying him, Corbyn would be better off rewarding those who have shown him great loyalty. He should fight to ensure that good, decent democratic socialists, purged by Labour’s Compliance Unit, are reinstated. He should support the return to the party fold of his old friend and fellow anti-war campaigner George Galloway, who was harshly and unfairly expelled from the party in 2003 on account of his outspoken opposition to the illegal Iraq war. Galloway is a superb orator, has a huge following on social media and would be a tremendous asset to Labour. At the same time, Corbyn should go on the offensive against his enemies and support the deselection of those Labour MPs who arrogantly refuse to respect the views of party members. If Corbyn stays radical and commits unequivocally to a clean break with the phoney elite-friendly consensus on economic and foreign policy and keeps his promise to give more power to members, he has a fighting chance of becoming the next Prime Minister. If he banks to the right though, and decides to “play it safe” in order to appease the Bitterites, then he’ll definitely lose and a historic opportunity to reshape British politics for the benefit of the 99%, will have been squandered. Neil Clark is a UK-based journalist, writer and broadcaster, regular contributor to newspapers and magazines in the UK and overseas including The Guardian, The Week, Morning Star, Daily & Sunday Express, The Mail on Sunday & The Spectator. He describes himself as a strong opponent to the neo-conservative war agenda – and says he believes in the urgent necessity of a left-right anti-war coalition.